SYDNEY, Australia – Kristina Kerscher Keneally, 40, a U.S.-born Catholic with degrees from the University of Dayton, won the position of premier in Australia’s most populous state in a Dec. 3 Labor Party ballot. Keneally replaced Nathan Rees, who lost the confidence of parliamentary colleagues and was deposed as party leader. She has been a member of the state parliament since 2003 and was the New South Wales government’s spokeswoman for World Youth Day last year. Keneally described herself as a “working mum” and rejected accusations that she was a puppet of Labor Party power-brokers. She said she would focus on transportation, health and education policies, economic recovery and caring for the most vulnerable, including people with disabilities. ‘‘Over the next 15 months I ask this of the community: to judge us on what we deliver,’’ she said. Born Kristina Kerscher in Las Vegas, the daughter of a U.S. serviceman and an Australian mother, Keneally grew up in Toledo, Ohio, where she attended high school at Notre Dame Academy. She attended the University of Dayton, where she received her undergraduate degree in political science in 1991. She was a founding member of the National Association of Students at Catholic Colleges and Universities, serving as its president in 1990 and 1991. She worked as a volunteer teacher in New Mexico before earning a master’s degree in religious studies from the university in 1995. In 1991 she attended World Youth Day in Poland, where she met her future husband, Ben Keneally. The couple has two sons. 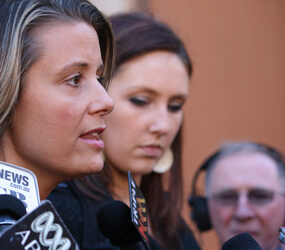 Keneally became a permanent Australian resident in 1994 and a citizen in 2000. She joined the Labor Party in the same year. Her first job was state youth coordinator for the New South Wales Society of St. Vincent de Paul. “His unsatisfactory answer prompted me to see how women are disadvantaged in the church and in society,” she said.